First time in print... "It's no wonder that AKrentz's? novels consistently hit bestseller lists." Publishers Weekly Eclipse Bay has grown and flourished on the rugged Oregon coast, where the shore can be rocky and forbidding, full of sharp cliffs and hidden coves. 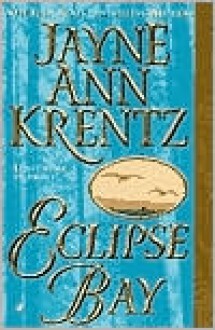 Eclipse Bay by Jayne Ann Krentz, this small town is also filled with secrets as treacherous as the landscape and rivalries as fierce as an ocean storm. Their grandfathers hated each other. Their fathers hated each other. And as the next generation of the Hartes and Madisons, Hannah and Rafe are expected to hate each other too. But Hannah Harte, a successful wedding consultant with a skeptical view of marriage, remembers the long-ago night on the beach that revealed Rafe as much more than just "that disreputable Madison boy." And Rafe remembers the heroic gesture that proved Hannah's fierce spirit was stronger than any feud and saved him from near-certain imprisonment. Now reunited by a surprising inheritance after years of living their separate lives Rafe and Hannah return to Eclipse Bay, and the hostilities that still divide, and bind, their families. And they are discovering something that is at once delightful and deeply disturbing? They don't hate each other. Not at all. 3-16-11 As a confirmed "foodie," I really am enjoying this. 3-17-11 Strong start, OK middle, weak ending.